Are you looking to install, replace or repair your West Linn skylights? West Coast roofing can help you with every aspect of your West Linn skylight project! Skylights have a bad reputation for leaking, and the truth is that if a skylight is not installed correctly, even the best skylight will leak. 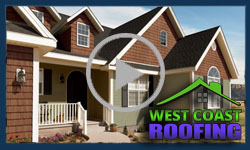 West Coast roofing has replaced and repaired hundreds of skylights in the West Linn area. We know what to look for and what projects can arise, so you can rest assured that when West Coast Roofing installs your skylight it will be done properly and to the highest of standards, guaranteed! to properly remove and install new roofing materials around your West Linn skylight. Most leaking skylights in the West Linn area are caused by the flashing around the skylight, not the skylight system itself. Skylight flashing can refer to a wide variety of materials depending on the type of skylight installed, but the material is usually a rubber, plastic or metal fitting that acts to create a waterproof junction between the roof and the skylight. The cost of installing, repairing, or replacing your skylights can vary based on a range of factors. Roof pitch, site access, and roof material will all affect the final price or your skylight installation or replacement. Are you in need of a skylight installation, repair, or replacement for your West Linn area home or business? Contact West Coast roofing today and let us help you with your West Linn skylight project!